Bat Poo, Dragon Droppings & Sheep Poo, these are just a few of the things you'll find in one of the quirky little tins in our Animal Collection. 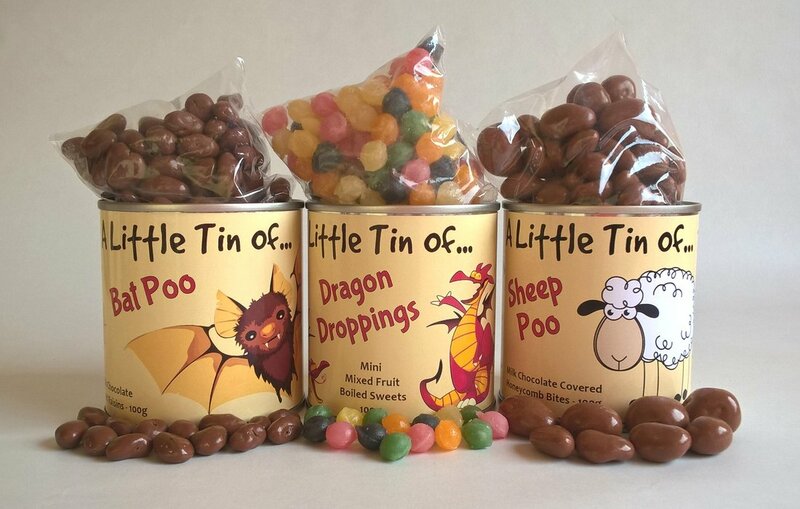 Aimed at children, who especially love the idea of eating something disgusting, to make sure they're safe the tins might be labelled Droppings or Poo but the contents are all edible sweet treats! Those scurrying little feet and twitching whiskers can only mean one thing, there's a rat about! We have a tame family of rodents which keep our supplies well topped up. 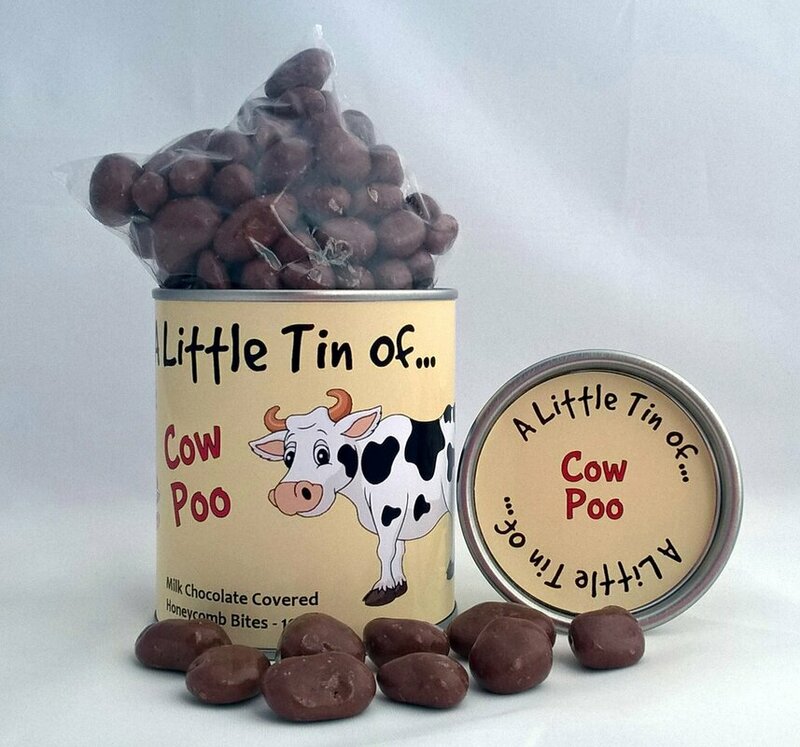 Tin contains Milk Chocolate covered Raisins. The lush green northern fields our flock graze mean these treats won't leave your mouth feeling woolly! Tin contains Milk Chocolate Covered Honeycomb Bites. A rustling noise and a little button nose peeking out from a pile of fallen leaves signals we've found the right place to gather a plentiful supply of Droppings from these cute animals. Arriving straight from the high plains of the South American Andes our Llama Poo is some of the freshest and most colourful available! 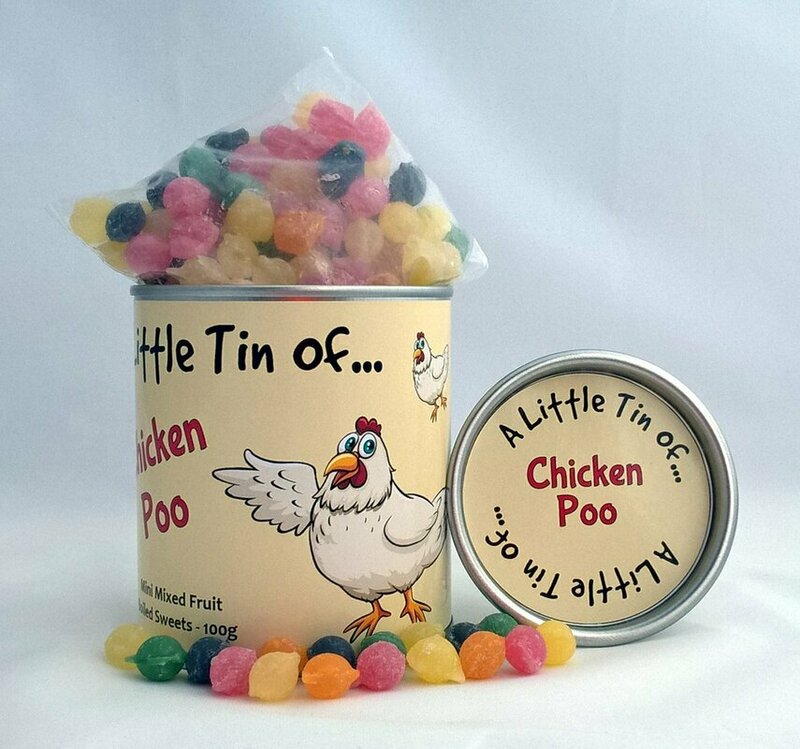 Tin contains Mini Mixed Fruit Boiled Sweets. The local park is over-run with these little critters so all we need to do is stand under a tree for a while to fill up the tins! Yes, we hunt foxes but only so that we can collected what we need to fill our tins, we can guarantee none are hurt in the process! Not sure we should put the Chickens next to the Fox but they have promised to be on their best behaviour so our brood carry on clucking happily! The cows are very happy to munch the grass in their field to produce more than enough content for these tins. Some people claim Dragons don't exist but we have proof! We've been to a secret location to carefully collected these tasty droppings. We know you'll be happy to get your snouts into these tins carefully filled from local free range farms they contain only the best Poo! Hiding in the bushes we've nipped out to grab these gems, Doyathinkysaurus? It's a little known fact that Unicorns spend most of their time prancing around whilst we follow and clean up the poo so they don't land in it. We've been sneaking around trying not to disturb the roosts to collect these prime high quality examples of Bat offerings. Do you know just how hard it is to follow rabbits as they bounce around to collect enough to fill our tins? It's hard work! Please note: Images are for illustration purposes only, tin contents may be subject to change. Looking for other stock such as mugs, metal signs, drinks coasters & travel sweets? Then visit our sister site Gingerwick for some great products!